On September 13 RICOH will announce the arrival of a new Super High Imaging Quality compact digital camera. This exceptional camera will be the digital version of the well-known GR analog camera series. The GR1 was first launched in October 96. Thereafter followed the GR1s, GR10, GR21 and GR1V. Although using 28mm and 21mm wide angle lenses, the quality was such that images were sharp right up to the edge; in fact a special L-mount version of the 28mm GR lens was made and rated highly by specialist reviews. As a result these cameras became popular with professional photographers and enthusiasts the world over. This is a response to a request from loyal GR serices customers. 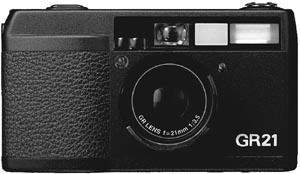 The Ricoh GR21 camera was named Best Prestige Camera by TIPA (Technical Image Press Association)for its very compact, slim, lightweight body and luxury well finished magnesium cover. It gives the expert full control of depth of field due to it's aperture-priority automatic mode. In this package is hidden an optical jewel, a super-wide angle 21mm lens, giving the traveller the capacity to capture unique landscapes or candid images with a camera that easily slips into a shirt pocket. A GR lens 21mm lets you take photographs boasting all the effects characteristic of a super-wide lens. Aperture Priority AE lets you choose the aperture setting, from F3.5 (fully open) to F22, in 12 steps. Passive-type multi autofocus system is so accurate that it can focus on a object located on the other side of a transparent window. Ultra-thin, compact body offers remarkable portability. Close-up effect down to 30cm. Auto bracketing virtually ensures great shots under difficult lighting conditions. Passive-type 7-zone multi-autofocus with 3-point indication. Infinity mode, Single AF mode, Snap mode, Fixed focus mode. Program AE mode: Approx 2 – 1/500 sec. Aperture priority AE mode: Approx. 2 – 1/125 sec, 1/500 sec. (at F16). Time exposure mode. Reverse Galilean type with LCD bright frame, in viewfinder illumination under low light. ISO 25-3200. Compatible with DX code system. Ricoh auto-load pre-wind system. Film pre-winds to the last frame number when back cover is closed. Mid-roll rewind is possible. Electronic, counts down number of exposures left. Electronic flash automatically adjusts light amount to ambient light conditions. Automatic flash for dim light and backlight conditions. Automatic soft flash for subject at close range. Auto. On. Off. Red-eye reduction. Slow synchro. Built-in 10-second digital timer, operation indicated by LED. Approx. 5 m in. after operation. Cable release socket, Synchro terminal, Date imprinting. 204g (7.2 oz) without battery.